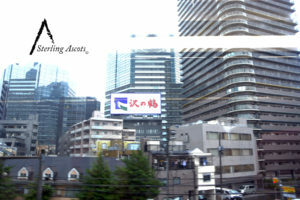 Tokyo, Japan (Shibuya Ward) – It’s a humid 86 degrees at 21:30 (9:30 pm) in Bangkok, Thailand. 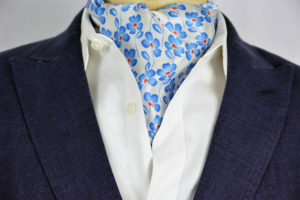 As you would imagine, 86 degrees may not be the most ideal temperature for ascots but we have an ascot to answer to warmer temperatures. 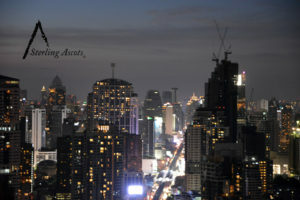 As I finalize my check out arrangements at the Marriott Exec Apartments (Sukhumvit Thonglor), I am complimented on my ascot by the manager at the front desk. He makes a followup comment explaining that ascots were making a big comeback the last time he was in South Korean. 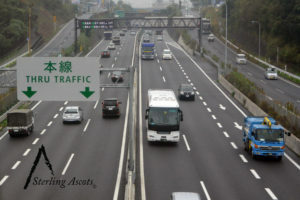 As I thank him, I make one last adjustment to my Shinjuku Sterling Ascot for the road. He then asks: What time is your flight home? As I step off the plane in Narita, Japan, I quickly learn that very few people speak English here. This was new to me as I’ve always been spoiled to encounter people who speak English in all of my previous international travels. It’s about 7am in Japan, I’m less than well rested but my adrenaline helps me navigate my way through Narita Internation (NRT) to the N’EX high speed train line…next destination: the Shibuya Ward of Tokyo. Before I go any further, lets get the boring stuff out of the way…after all we are here for ascots right? (the travel aspect is better)! 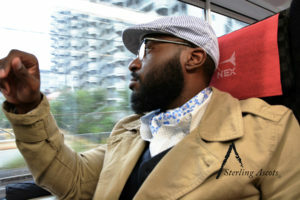 The Shinjuku Sterling Ascot is comprised of silk and more importantly, it’s not interfaced. 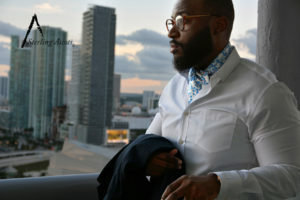 Interfacing is a term used to describe the fabric lined inside of an ascot. The lack of interfacing makes this ascot extremely light in weight and easier to fluff. Some of our other non-interfaced ascots are the Monte Carlo, Medallion Spec, and Botanical Sage ascots. These ascots are great for warm temperatures and extremely comfortable in any environment. Going from 86 degrees in Thailand to a rainy 55 in Tokyo, the Shinjuku Sterling Ascot performed admirably in both conditions while helping me maintain the smart casual dressed down look I was going for. One thing I can honestly say about Shibuya is that it truly is the fashion capital of Japan…and based on what I’ve seen, Tokyo could give NYC a STRONG run for it’s money in the world of fashion. I’m almost convinced that some of the most well known fashion bloggers here may get a lot of inspiration from the Shibuya scene. As I struggle to stay awake on my feet, I spot a Starbucks hanging over Shibuya Crossing (Shibuya’s famous intersection). I run inside and get a coffee…within minutes the world seems brighter. 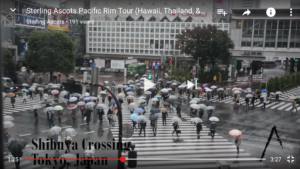 While in Shibuya, it’s a must that you make your way over to 109Men and 109Women. 109Women is an actual building with 8+ floors of women’s shopping and 109Men is the same concept with about half the shopping. As I wander in, I’m immediately drawn towards a wide range of men’s felt hats. I try one on and immediately fell in love with the way it paired with the Shinjuku ascot. I loved that one hat so much that I bought 6 to go along with a number of other things. I immediately turn to Q and tell her the next time we come to Tokyo, we need to come with empty suitcases. Hungry and on the go? This is where the ascot blog makes a weird turn: McDonald’s…to be more specific, McDonald’s fries. Japan is known for their potatoes and my primal instinct is to test out Japan’s potatoes through their french fries and if you’re a lifetime fan of McDonald’s fries in America, I promise you that the fries in Japan are twice as good. As my hands are filled with shopping bags from 109Men, I make my way into Adidas for a quick look around. 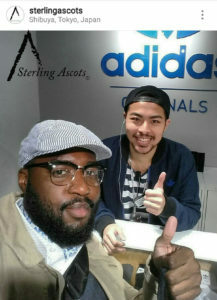 I’m greeted with “welcome to Adidas.” I was shocked as I finally found someone that spoke English. I quickly spark up a conversation with him and I quickly learn that he learned English through Rap and Hip-Hop music. During this conversation, I quickly learned that anything over a medium in men’s sizes get charged more because it’s more material (thoughts: I need to lose weight). I find the Adidas crew socks I was looking for and pay for it. As the sales rep handed me my bag, he says nice ascot. Immediately, I wish I had bought more then I asked for a selfie. As we make our way back for some rest, an extremely small version of a metro bus pulls up. 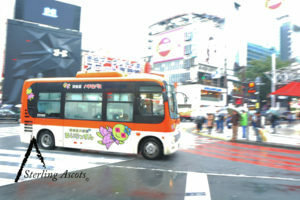 For about 100 Yen a person, you can take this small bus also known as a Hachiko bus to many different parts of Shibuya. Tokyo just continues to surprise.